To create a template, click the Go menu, and then Edit Templates. Give your template a name and fill in some text and it will auto-save it for you. You can use anything in a template that you would use in a normal entry. To insert a template, right-click anywhere in an entry and choose Insert Template. Click Go > Edit Styles. If you want to overwrite any default styles (e.g. p, h1, h2, etc), you can alter the editor CSS directly on that page. In case you need it, the default CSS is here. 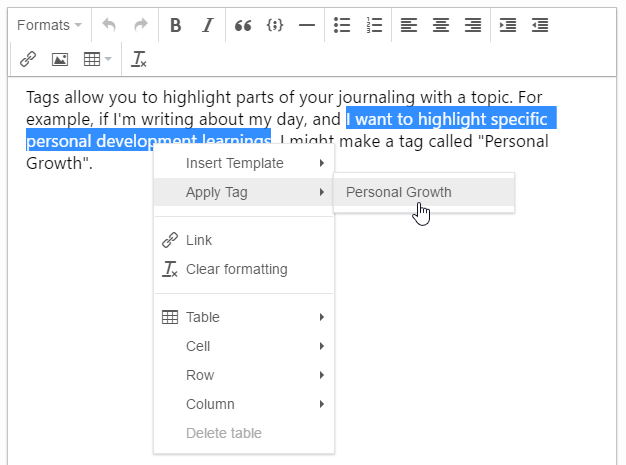 Tags allow you to highlight parts of your journaling with a topic. For example, if I’m writing about my day, and I want to highlight specific personal development learnings, I might make a tag called “Personal Growth”. Pulling up entries with that tag is coming in the next major version, but you can start storing the tags now. Your entries are stored as plain HTML5 inside an Sqlite3 database, encrypted with SQLcipher. You can access this data at any time with DB Browser. If you run into any bugs, please submit an issue on GitHub.